Despite US President Barack Obama’s absence, State Secretary John Kerry’s visit still underlines the increased bilateral engagement between the Philippines and the US. It comes at a time when US foreign policy is increasingly focused on the region under its so-called pivot to Asia Pacific. The visit, which follows a series of high-profile exchange of visits between top Filipino and American Executive and Defense officials since 2010, is controversial amid ongoing talks between Manila and Washington to increase rotational presence of American troops in the country or basing privileges and the still ongoing territorial spat with China. While much of the discussion about the pivot and renewed PH-US relations centers on the military aspect, there is also the equally crucial, if not even more far-reaching, economic dimension of the pivot. Under the Obama and Aquino presidencies, mechanisms to facilitate further reforms in the economy that promotes US economic interests are steadily being set up through US foreign assistance programs such as the comprehensive, multi-donor Partnership for Growth (PFG) initiative. Silently, the PFG and other US efforts are setting the stage for an even more wide-ranging and systematic US intervention in the country’s internal policy making. 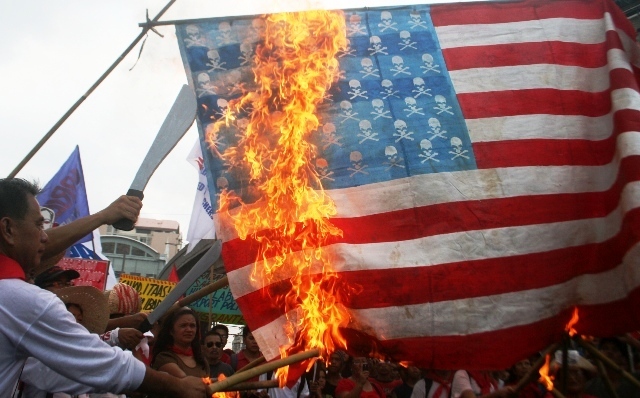 The US has been able to perpetuate Philippine dependence on the US economy. American investors remain the biggest source of net foreign direct investments (FDI) in the Philippines. From 1999 to 2012, net FDI from the US reached $4.52 billion, accounting for 19.8% of the total during the said period. Last year, US net FDI was pegged at $784.74 billion or 38.6% of the total, and 248.9% higher than the figure in 2011, at a time when investments from Japan, the European Union (EU), Asean and others have sharply declined. Similarly, the US continues to be the number one buyer of Philippine exports and biggest supplier of its imports. Direct Philippine-US trade for the period 1999-2012 was $218.64 billion or 17.5% of the total. During the same period, the US accounted for 19.4% of Philippine exports and 15.8% of imports. Certainly, the figures are much higher when one considers that a portion of Philippine trade with Asean and East Asia actually ends up with the US. Finally, the US also accounts for the largest source of remittances from overseas Filipinos (OFs), including overseas Filipino workers (OFWs). From 1989 to 2012, total OF remittances reached $205.71 billion, of which $108.30 billion or an overwhelming 52.6%, come from US-based migrant workers. Preliminary data for 2013 covering the months of January to July show that remittances from the US reached $5.54 billion or 43.9% of the total during the said period. Since the 1980s, OF remittances have become the largest source of foreign earnings for the Philippines and practically keeping the backward economy somehow afloat. The figures from the US are bloated a bit by the practice of remittance centers in various cities abroad to course remittances through correspondent banks that are mostly US-based. But consider also that based on the latest (2009) stock estimate of OFs, US-based OFs account for 2.88 million of the 8.58 million Filipinos abroad, or 33.6% of the total. Through the decades, the US has spent substantial amounts to sustain and deepen its clout. Disbursements of bilateral official development assistance (ODA) from the US for the Philippines from 1999 to 2011 reached $1.12 billion, 20.9% of total disbursements during the said period and the second largest behind Japan. However, while ODA disbursements from Japan have been considerably falling since the 2008 global financial and economic crisis, bilateral US aid during the same period has steadily increased, growing by an annual 18.5% from 2009 to 2011. Under the Obama administration and its announced pivot to Asia Pacific, disbursements of bilateral US economic aid have substantially increased. From an annual average of $108.12 million and a yearly growth of 4.6% from 2001 to 2008, US bilateral economic aid to the Philippines jumped to an annual average of $152.23 million and a yearly expansion of more than 18% from 2009 to 2011. While already expanding, US assistance to the Philippines is anticipated to further increase with the introduction by the Obama administration of new initiatives that facilitate greater US intervention in the country. Requested US aid for the Philippines for fiscal year 2014 is pegged at $188 million, 17.1% higher than the base appropriation for fiscal year 2013. One such new initiative is the Partnership for Growth (PFG), a signature inter-agency effort of Obama’s Presidential Policy Directive on Global Development, which claims to “elevate economic growth in countries committed to good governance as a core priority for US development efforts”. The PFG supposedly aligns with policy reform areas outlined by President Aquino in the Philippine Development Plan (PDP). The PFG is defined by the active participation and coordination of more than a dozen US government agencies led by the State Department, USAID and the MCC as well as multilateral donors like the World Bank, International Monetary Fund (IMF), United Nations (UN) agencies and even non-government organizations (NGOs) and private corporations. A Statement of Principles was signed by both countries during the November 2011 Manila visit of then State Secretary Hillary Clinton. The document reflects the two governments’ supposed mutual goal to place the Philippines on a path to sustained, more inclusive economic growth, and elevate it to the ranks of high-performing emerging economies. For the US, the PFG will better position the Philippines in its objective of joining the TPP in the future. An example of how US steers internal policy making is the PFG’s centerpiece program in the Philippines, which is the $433.91-million grant from the Millennium Challenge Corp. (MCC). The MCC is a highly conditional aid and requires the Philippines to, among others, maintain so-called “economic freedom” to continue receiving the grant. For instance, one of the indicators of economic freedom, as designed by the MCC, is the Trade Policy Indicator which measures the country’s openness to international trade based on average tariff rates and non-tariff barriers (e.g. trade quotas, production subsidies, government procurement procedures, anti-dumping, local content requirements, etc.) to trade. The “Compact” or agreement between the Philippine government and MCC is that the latter may suspend or terminate the grant if the country fails to reverse its policies that are inconsistent with the Trade Policy Indicator and other indicators designed by the MCC. Also, the MCC grant does not only facilitate further liberalization of the economy but serves as a tool as well for US intervention in counterinsurgency. Aside from the the $214.4-million Samar Road project, which targets communities in Samar that are considered strongholds of the New People’s Army (NPA), the MCC grant also includes the $120-million Kapit-Bisig Laban sa Kahirapan – Comprehensive and Integrated Delivery of Social Services (Kalahi-CIDSS). Kalahi is essentially the “social development” component of the military’s counterinsurgency campaign in Mindanao and in areas considered as stronghold of the NPA. Another project funded by the MCC grant is the $54.3-million Revenue Administration Reform Project (RARP) which aims to raise tax revenues, reduce tax evasion and revenue agent-related corruption. The rest of the grant is allocated to program administration and oversight. Early this year, USAID and the American Chamber of Commerce (AmCham) launched the The Arangkada Philippines Project (TAPP) as part of the implementation of the PFG. Through the USAID-funded TAPP, AmCham will push for the implementation of the policy proposals contained in the comprehensive advocacy paper “Arangkada Philippines 2010: A business perspective” prepared by the Joint Foreign Chambers of Commerce in the Philippines (JFC), of which AmCham is a key member. The JFC paper listed 471 specific recommendations that promote the interest of foreign corporations in the country through greater liberalization, deregulation, privatization and denationalization while intensifying the attack to the rights and welfare of the people. Among others, their proposals are to: amend the Labor Code to allow subcontracting and easier termination of employees; promote IT-BPO curriculum in colleges and education reform, adopt K+12 model; lift restrictions on foreign ownership in media and advertising; promote tie-ups with foreign firms; protect PPP investors from political (i.e. regulatory) risks including TROs from courts; scrap ‘unwarranted’ taxes on foreign carriers; lift restrictions on foreign equity in power projects; privatize Agus and Pulangi dams; build more transport infrastructure through PPP; review policy disallowing “take-or-pay” and sovereign guarantees; promote PPP in the water sector; establish an export development fund to promote exports and investment; allow manufacturing industry to operate with less government interference such as price controls; liberalize importation of capital equipment; liberalize shipping industry; fully implement Mining Act; allow foreign ownership of land and retail facilities; allow relief from minimum wages; review the Foreign Investment Negative List (FINL); apply ‘creative solutions’ to the 60-40 foreign ownership restriction pending Charter change (Cha-cha); privatize or close down government-owned and controlled corporations (GOCCs) to reduce fiscal burden, among others; use advisers (amicus curiae) when Supreme Court (SC) is ruling on issues that adversely affect the investment climate; promote labor flexibilization schemes; reduce corporate income tax and raise the value-added tax (VAT) and fuel excise taxes; and expand the conditional cash transfer (CCT) and Kalahi-CIDSS programs; encourage PPP in healthcare-related services. With assistance from the TAPP, the JCF started producing Legislation Policy Brief, which identifies broad recommendations for Congress and the Executive. Among the many proposals of the JFC is the lifting of constitutional restrictions on foreign investments, which the AmCham has long been openly advocating. 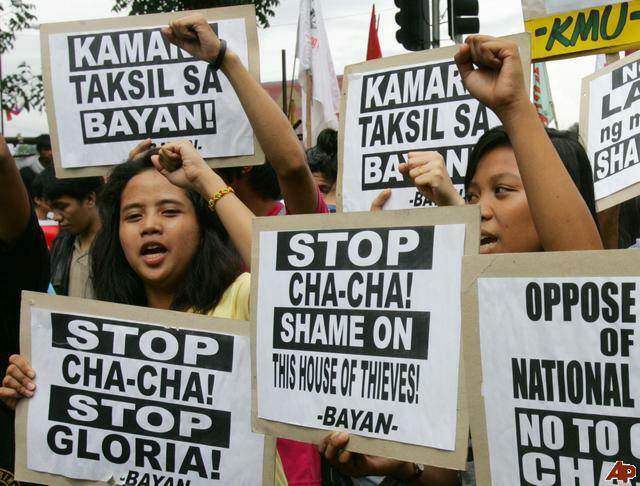 Thus, while Charter change (Cha-cha) is not explicitly identified in the PFG, its implementing components such as the TAPP provides pressure on the Philippine government to liberalize the Constitution. Meanwhile, just recently, the USAID announced a $24-million Philippine-American (Phil-Am) Fund, another component of PFG implementation in the country, intended for civil society organizations (CSOs) working on projects in the areas of entrepreneurship and promotion of new businesses, governance, fighting human trafficking, technology-driven adult literacy and biodiversity conservation. Complementing and reinforcing the PFG is the establishment of lobby group US-Philippine Society (USPS), a private sector initiative which claims to broaden and expand interaction and understanding between the two countries in the areas of security, trade, investments, tourism, the environment, history, education and culture. The group intends to create a new and timely mechanism to elevate the Philippines’ profile in the US by bringing its longstanding historical ties fully into the 21st century when American policy interests are increasingly focused on East Asia. It was officially launched on 7 June 2012 during President Aquino’s official visit to Washington. Its leadership includes John D. Negroponte, a former US Ambassador to the Philippines (1993-1996), first Director of National Intelligence (2005-2007) and former Deputy State Secretary (2007-2009), as co-chairman with Filipino business tycoon Manuel V. Pangilinan. Honorary chairmen are Maurice Greenberg, former chair and CEO of insurance and financial giant American International Group (AIG), and Washington Z. Sycip, founder of the Philippines’ largest multidisciplinary professional services firm SGV & Co. Current Ambassador to the US Jose L. Cuisia, Jr. is an ex-officio Board member. Aside from them, the Board of Directors of USPS is also comprised of the top executives from some of the largest American corporations, namely: Citigroup, General Electric, Procter and Gamble, JP Morgan, Chevron and Coca Cola, among others. Prominent Filipino businessmen like Jaime Augusto Zobel de Ayala, Ramon del Rosario and Enrique Razon are also members of the Board. The group’s current president is John F. Maisto, a former Political Officer of the US Embassy in Manila (1978-1982) and Director of Philippine Affairs at the State Department (1982-1986). The executive director, meanwhile, is Hank Hendrickson, a retired US Navy officer and former Foreign Service Officer at the US Embassy in Manila. On 21 January 2013, Negroponte led a so-called “powerhouse” delegation of the USPS in visiting the country, bringing with him officials of the American corporations belonging to the lobby group and held discussions with Aquino and top economic and defense officials as well as SC Chief Justice Lourdes Sereno to update on key economic and judicial reforms, including those under the PFG. 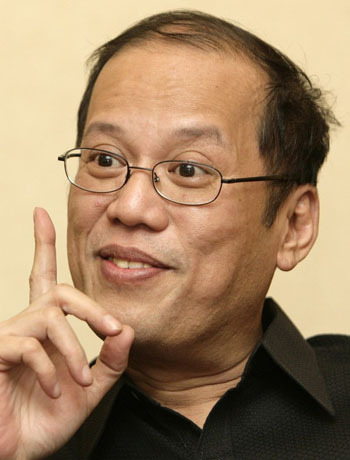 The US pivot and Aquino’s subservience to US interests are creating conditions for increased US intervention in the country not only militarily but also in terms of economic policy making and governance. A new era in the more than a century old colonial and neocolonial relations between the Philippines and the US is indeed being ushered in by the Aquino and Obama regimes. The serious implications on national sovereignty, human rights, regional peace and stability and even on the environment of greater US military presence and intervention are well-documented and widely discussed. However, there is a big challenge for advocates of national sovereignty and patrimony to deepen and widen the public discourse on US intervention and the Asia Pacific pivot to equally underscore how the US, in its desperate efforts to abate its latest economic crisis, is increasingly and systematically laying the groundwork to further steer the national economy towards serving its monopoly capitalist interests. There is a need to draw and highlight how Philippine-US colonial and neocolonial ties and decades of neoliberal restructuring and reforms have stunted national development and destroyed industries and livelihood, perpetuating chronic poverty and the permanent economic crisis in the country. Mrs. Gloria Macapagal-Arroyo today confirmed what the public knew all along, that she is not giving up power next year and will seek a congressional seat in Pampanga’s second district. Their game plan is to use Congress only as a route toward clinching the position of Prime Minister in a parliamentary form of government that shall be created through Charter change (Cha-cha). 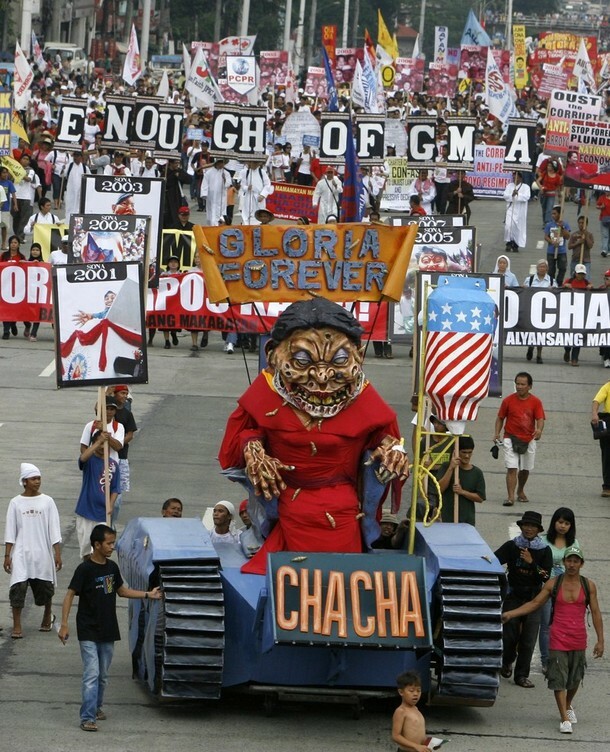 If this sinister scheme will push through as planned, it will indeed be “Gloria Forever” as repeatedly warned in the past by critics and political observers. This move by Arroyo and her political operators is a travesty of democracy in the highest order. Nothing in existing laws of course prevents Mrs. Arroyo from running as congresswoman. But for many people including even legal experts, the issue is no longer simply about what the law allows but what decency and delicadeza dictate – which today Mrs. Arroyo has again made clear are virtues beyond her comprehension. Mrs. Arroyo will not give up power and will do everything she can, at all costs, to use government in order to avoid accountability for the very long list of crimes she has committed against the Filipino people since 2001. Her administration has earned the notoriety as the most vicious, most brutal regime in terms of repressing the people’s basic human rights and has done this even without formally declaring Martial Law like Ferdinand Marcos. Almost 1,110 people have already been killed by her terrorist regime aside from almost 200 people who have been abducted by suspected military, paramilitary and police elements and remain missing to this day. This climate of impunity emboldened her allied warlord clans like the Ampatuans to massacre people as they please, knowing that they can get away with it because their patron is the biggest warlord at the helm of Malacañang. Her regime challenges the Marcos dictatorship not only in terms of human rights violations but also in terms of massive corruption. The Philippines has consistently ranked among the most corrupt countries in the world. Mrs. Arroyo’s personal declared wealth has jumped by 164% since becoming president in 2001 (from P66.75 million to P177.18 million) and certainly this is just the very small tip of a very large iceberg. By the way, the number of poor families during the same period increased by 2.3 million or an additional 11.5 million poor people as Arroyo, her family, her cronies and allies enrich themselves. That Mrs. Arroyo declared her intention to run at a time when the public is deeply outraged by the Ampatuan massacre and her lack of swift action against a favored warlord is only but a fitting move for a regime so absolutely detested, so totally isolated from the people. Sige lang at gatungan pa ninyo ang galit ng taumbayan. May araw din kayo.